Young, pampered seedlings that were grown either indoors or in a greenhouse will need a period to adjust and acclimate to outdoor conditions, prior to planting in the garden. This transition period is called "hardening off." Hardening off gradually exposes the tender plants to the wind, the sun, and rain and toughens them up by thickening the cuticle on the leaves so that the leaves lose less water when exposed to the elements. This helps prevent transplant shock; seedlings that languish, become stunted or die from sudden changes in temperature. The length of time a seedling requires to harden off depends on the type of plants you are growing and the temperature and temperature fluctuations. So be flexible when hardening off your seedlings and be prepared to whisk them indoors or cover them if there is a late freeze or snow. 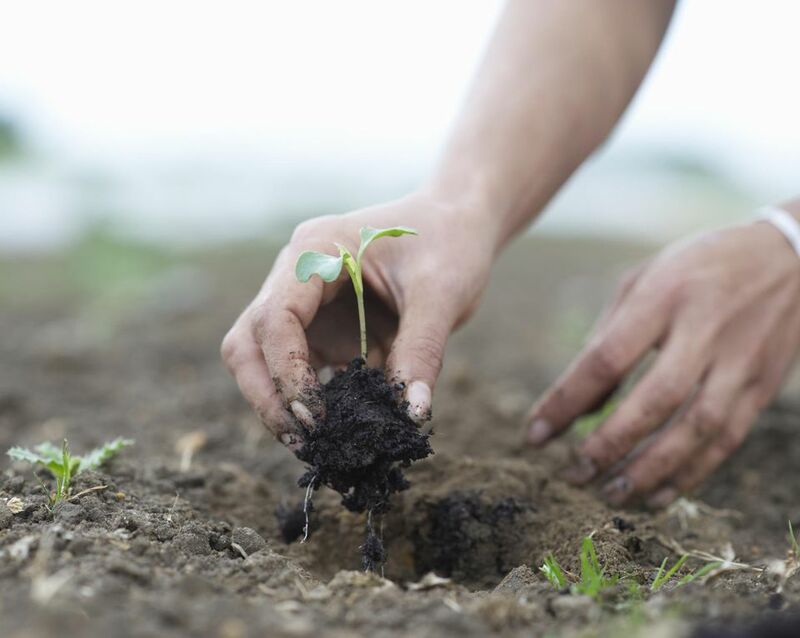 Begin putting your seedlings outdoors about 7 - 10 days before your actual transplant date. Place the plants in a sheltered, shady spot outdoors. Under a tree or even on your back porch is fine. Start by leaving them outdoors for 3 - 4 hours and gradually increase the time spent outside by 1 - 2 hours per day. Bring the plants back indoors, or somewhere warm like a heated garage or porch, each night. After 2 - 3 days, move the plants from their shady spot into morning sun but return them to the shade in the afternoon. Too much direct sunlight will scorch the leaves. If temperatures remain warm both day and night, (at least 50F. ), the plants should be able to handle the sun all day and stay out at night after about 7 days, Keep an eye out that the soil doesn't dry in their small pots and bake the plants if the weather should suddenly turn warmer. Move your plants to the cold frame about 7 - 10 days before your transplant date. Be sure the temperature in the cold frame does not go much below 50F. or above 80F. While they are in this warm, sheltered environment, be sure to check the soil daily, to see if the plants need water. Turn off heating cables and/or open the cold frame cover for gradually longer periods of time each day. Start with 3 - 4 hours and gradually increase the exposure time by 1 - 2 hours per day. Close the cover and resume heating at night, if temperatures dip below about 40F. Although it seems counterintuitive, allowing seedlings to wilt has the same effect as gradually exposing them to the elements. Starting about 2 weeks before your transplant date, stop watering your seedlings until they start to wilt. Watch closely. You do not want to leave them dry and wilting for a prolonged period of time. There is not much soil in a seedling pot, so it should not take long for the soil to dry out and the plants to wilt. Once they start to wilt, you can water them again, and then wait for them to wilt again. After 2 weeks of this process, seedlings should be ready to transplant. As always, try to do so on a cloudy day and be sure to water well after planting. If you opt to gradually expose your plants to longer periods of time outdoors, the moving in and out process can be made easier by putting your plants on a wagon or wheelbarrow and simply wheel them into the garage for the night. Don't forget to protect your young seedlings from animals and snails or slugs. Put them on a table or somewhere animals will not notice them.